Wiring is perhaps not one of the most exciting things to talk about if you are a house design junky. Getting power and lights to where you need them is unglamorous and underappreciated. But wiring is probably the biggest factor that determines whether a prefab house can arrive at the site finished on the inside, or empty - just a shell. Why is that? The reason is that wiring is like the nervous system of your house. It runs in every wall, reaching out to switch locations, and lighting locations. It reaches every corner of the house without regard for whether or not those walls want to come out to the site in one piece or not. If a room can not come out to the site in one piece as it does in a modular house, then its likely it will come without the wiring. If walls come without wiring, then that means they are going to come without finishes because the wiring has to go in first. US style plastic junction boxes. Here is the problem. 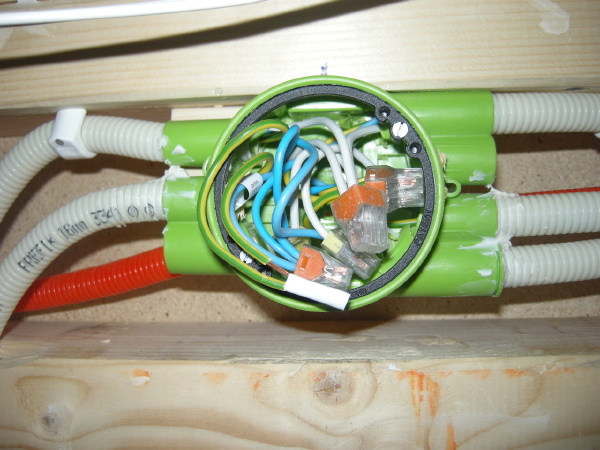 In the US wiring connections must happen in a junction box, or j-box. Typically these connections are made in the boxes that lie behind switches and outlets or light fixtures. The reason is because anyplace you have a j-box you must have a cover to access that box - it can not be buried in a wall behind the wall board. And so it makes sense to make those connections at the devices which already come through to the surface, like switches and outlets. Ok - everybody is straight on that? Lets rewind to the prefab house factory. We want to build separate wall panels finished inside and outside like our friends in Sweden. But this means we have wiring in each wall section that must be connected when the walls go in place. But our connections have to happen at outlets boxes which are floating in the middle of the walls? What do we do? Introduce j-boxes with covers at the corner of each room? No. How about we leave a length of wire hanging out and fish the wire to the box? That would work in theory, but in practice it means having an electrician there when the wall panels are set, and leaving the wall panels dangling from the crane while the electrical work happens, and pulling that last bit of wire through in sync with the panel landing so the slack is not in the way. Forget it. The real problem is not the boxes, its the wire. There are two components to a wire - the conductors, and the shielding for the conductors which prevents them from being damaged by nails and picture hangers. In the US commercial construction the shielding is usually metal conduit, either flexible or rigid. The conduit is typically laid and later the conductors are pulled through it. Connections can be made between conduit anywhere with proper fittings, and the conduit terminates at a box. Great - so we can join the conduit where the panels meet and pull the wires later, right? Not quite. The metal conduits are much more expensive and not used in residential construction. What you find in houses here is plastic shielded wire which is great stuff and inexpensive, but it bonds together the conductors and the shielding which means the two functions must go in at the same time and never a break between boxes. 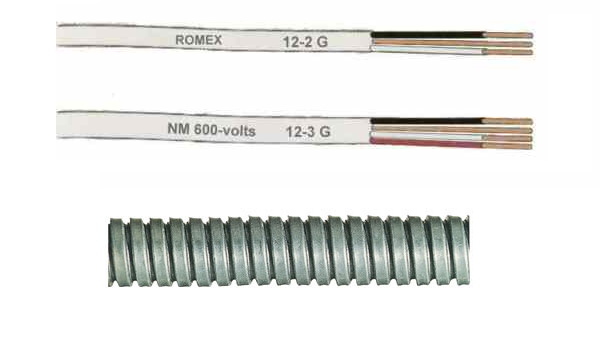 Top: US style plastic shielded cable, bottom: US steel flexible conduit. So, what we need is a decent inexpensive conduit system for residential prefab construction. Just like the Swedes have. Yes, of course that is the punch line, and once again the sick joke is on the US prefab industry. Our wiring fouls our progress every step of the way. The Swedes have redesigned their electrical components to make prefab easier. Lets look at their system briefly. They use a flexible plastic conduit system, much lighter than our flexible metal, and equal or stronger than our plastic shielded wire. The ends snap onto the fittings on their plastic j-boxes making connections rapid and precise. They also have fittings that let you join lengths of conduit between boxes as you would where two prefabbed wall panels come together. I wish there was more to say but its that simple. Swedish junction boxes and plastic flexible conduit. After the house is set the conductors are pulled in the field using pull cords and fish wires. There is no way to avoid that field work until someday there are code approved connectors that do not require junction boxes. Such a product would allow panels to be plugged into one another when they are set speeding prefab construction. There are also some useful accessories in the Swedish electrical parts that any builder would appreciate. In the US after the electrical rough-in is complete the drywallers come through and cover everything up. Somebody has to go around and find all the outlet and switch boxes again and cut them open. The Swedes have temporary covers that fit over their junction boxes. These covers have a magnet in them that makes finding them again easy. The magnet is centered, so this used to center a hole cutter that fits a power drill. It quickly cuts the wall board to just the right size. The temporary cover is removed to be reused again, and the box is ready for wire to be pulled. This really reduces a thankless job to an easy task. ... overall I think the point is that this is an affordable way to install the wiring paths for subsequent field assembly and in-field conductor installation. It reflects an innovation as significant as PEX tubing (that is the plastic tubing used for plumbing, Greg) in terms of speed of installation, and flexibility of assembly. A Swedish junction box installed. You can see the plastic conduit very clearly here. So that is the story of wiring and prefab in Sweden. We'll look at plumbing next. And we are getting closer to the end - thanks for following this story and all your comments. And all our thanks to Scott Hedges for the info and images of Swedish construction. I know. It makes you realize that prefabrication is a comprehensive issue. All trades have to be behind the effort, and the manufacturers that supply them. 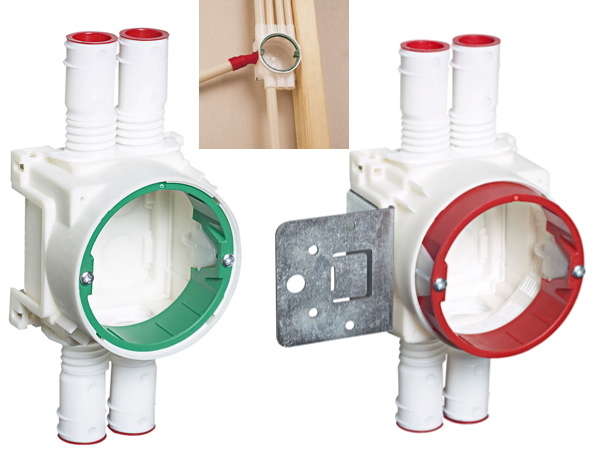 We are actually starting to see code approved plug/socket connectors that can be sealed behind the drywall come to market in the US. This would make rapid field assembly of prefinished wall panels easy.